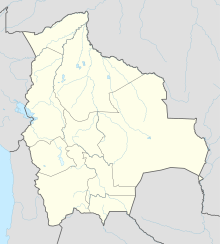 Ulla Ulla Airport (ICAO: SLUU) is an extremely-high elevation airport 3 kilometres (1.9 mi) north of Ulla Ulla village in the La Paz Department of Bolivia. Ulla Ulla is close to the Peruvian border north of Lake Titicaca. While the entire region is mountainous, the airport is on an alluvial fan of the Cordillera Apolobamba mountains, with no hazardous terrain nearby. It also shares use as a road. ^ Google (2013-08-21). "location of Ulla Ulla Airport" (Map). Google Maps. Google. Retrieved 2013-08-21. ^ Airport information for Ulla Ulla Airport at Great Circle Mapper. This page was last edited on 26 February 2017, at 09:47 (UTC).